Writing, the ability to make language visible and permanent, is one of humanities' greatest inventions. 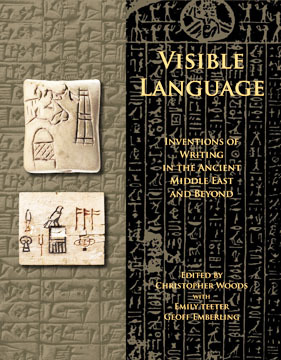 This book presents current perspectives on the origins and development of writing in Mesopotamia and Egypt, providing an overview of each writing system and its uses. Essays on writing in China and Mesoamerica complete coverage of the four "pristine" writing systems — inventions of writing in which there was no previous exposure to texts. The authors explore what writing is, and is not, and sections of the text are devoted to Anatolian hieroglyphs of Anatolia, and to the development of the alphabet in the Sinai Peninsula in the second millennium BC and its spread to Phoenicia where it spawned the Greek and Latin alphabets. This richly illustrated volume, issued in conjunction with an exhibit at the Oriental Institute, provides a current perspective on, and appreciation of, an invention that changed the course of history. For an up to date list of all Oriental Institute publications available online see AWOL - The Ancient World Online - 2: The Oriental Institute Electronic Publications Initiative. The British Library Digitised Manuscripts launched today. Today we launch our Digitised Manuscripts site, which features full coverage of 284 Greek manuscripts drawn from our Additional and Harley manuscript collections. The manuscripts, dating from the sixth to the 18th centuries, encompass a wide range of literary, historical, biblical, liturgical and scientific texts. Some of the manuscripts are beautifully illuminated, including an artistic highlight of the collection, the Theodore Psalter (Add. MS 19352). This 18-month project, funded by the Stavros Niarchos Foundation, is a pilot for our wider plans to digitise the medieval and earlier manuscript collections. We will be enhancing the functionality of the site and adding more content - both Greek and Latin manuscripts - over the next 18 months. La Revista Virtual Byblos nace de la dificultad planteada en los últimos años de estar al tanto de la ingente producción bibliográfica que en los campos histórico e histórico-jurídico se ha generado. En los países anglosajones, donde el desarrollo de los recursos en red está más avanzado, hace tiempo que algunas universidades, aprovechando la extensión de las listas de distribución de correo, han creado páginas web donde el staff universitario y los miembros de dichas listas cuelgan periódicamente reseñas y, sobre todo, recensiones críticas de los trabajos leídos por todos ellos, de modo que, mediante este procedimiento, se consigue que el trabajo de lectura de todos enriquezca a gran número de personas, que se evitan la penosa tarea de leer gran cantidad de estudios. The CPP is an electronic catalogue of paraliterary papyri based on a Filemaker Pro database and implemented for the internet with php-programming. It contains descriptions of Greek papyri and other written materials which, because of their paraliterary character, cannot be found in the standard electronic corpora of literary and documentary papyri, the Thesaurus Linguae Graecae (TLG) and the Duke Data Bank of Documentary Papyri (DDBDP), so that they cannot be easily consulted or searched by non specialists. Generally, these texts have been published in scattered editions and, because of their diversity, have never been brought together in one collection. With the CPP project we want to fill this gap by making all the source materials easily accessible. This includes also a digital version of full text editions of the paraliterary fragments, both in plain beta code and in Unicode. The texts in beta code are simple transcriptions without any accentuation or diacritical signs, designed only to allow for easy searching. They are inserted into the CPP database as a separate field. The Unicode versions, on the contrary, are being presented as documents made accessible out of the CPP by a link. All Greek texts have been encoded with XML according to the TEI-guidelines and by an automatic conversion program they are now systematically being translated in the HTML-files displayed online. Although the CPP collection does not have the ambition to produce new scholarly editions, the texts are never simple reproductions of one particular edition but they are based on our own representation of the most recent edition or simply of the one we considered the best, and of the comparison with other editions. For the purposes of specialised research consultation of the printed editions remains necessary. In addition the CPP contains some unpublished material, but generally, less detailed information is available for these items, depending on the policy of the owning institution. The Search System has been designed so as to make possible many different types of complex searches, of which the Search Page presents some predetermined selections. Dear colleagues and friends of the CCER. The team of the Centre of Computer-aided Egyptological Research (CCER, Utrecht University) has developed pioneering and useful computing tools and international projects for Egyptological research since 1990 (among other things Manual de Codage, Multilingual Egyptological Thesaurus, Glyph for Windows & Extended Library, Coffin Texts Word Index, Egyptian Treasures in Europe, Global Egyptian Museum). The CCER was the driving force of the group Informatique & Egyptologie and the Horssen Meetings. CCER inspired Egyptological scholars, students and institutions to make use of these upcoming new ICT tools and helped them to implement them. Now 20 years after the founding of CCER it is time to accept that CCER has become part of history and that the well-known CCER site must switch to another life and a new concept. Some years ago it appeared that there was no future for CCER in the Netherlands. Besides its director retired. Therefore I have decided to stop finally also the shop of the site www.ccer.nl by the end of this year. I"ll transmit by then the site and all rights to my former assistant Hans van den Berg. He was my gifted and much appreciated "life-ware" and "soft-hand" during many years. He would like to use this site to record the history of Computing & Egyptology. He will continue and maintain some useful tools for Egyptology on this site as well. Until the end of this year there will be a sale with reduced prices of all available products of the former CCER (Glyph for Windows, Hieroglyphica, Coffin Texts Word Index etc.). Glyph for Windows is a 16-bit program and will not run with 64-bit (x64) operating systems. Because there will be no upgrade of the 16-bit version of Glyph and the extended library, I advise all of you to keep a PC with Windows XP, 32-bit Windows Vista or 32-bit Windows 7 to run specially Glyph for Windows in order to be able to process your hieroglyphic texts. The last version of Glyph for Windows Professional edition (including the extended library) which is compatible with aforementioned operating systems can be ordered for only Euro 100 (including Hieroglyphica). The Bulletin of the University of Michigan Museums of Art and Archaeology features scholarly articles related to subjects of interest to both UMMA and the Kelsey Museum of Archaeology, particularly their collections, exhibitions, and fieldwork programs. Written principally by graduate students, faculty, and curators affiliated with the museums and the Department of the History of Art at the University of Michigan, the Bulletin is peer reviewed and distributed internationally. Each volume includes accessions lists as well as several short essays on recent acquisitions or significant holdings. This collection contains volume 15 through the present. This collection contains volume 1 through 14. The Bulletin of the University of Michigan Museums of Art and Archaeology features scholarly articles related to subjects of interest to both UMMA and the Kelsey Museum of Archaeology, particularly their collections, exhibitions, and fieldwork programs. Written principally by graduate students, faculty, and curators affiliated with the museums and the Department of the History of Art at the University of Michigan, the Bulletin is peer reviewed and distributed internationally. Each volume includes accessions lists as well as several short essays on recent acquisitions or significant holdings. This collection contains volume 15 through the present. The Egyptian Amulet catalog is a collaborative project between the Kelsey Museum of Archaeology, and the University of Michigan's Digital Library Production Service. Initally developed on a fairly small scale (roughly 360 items), the catalog's purpose was to demonstrate the feasibility and value of transfering the Kelsey catalog of artifacts from a proprietary database system to an SGML-based system providing ubiquitous web access. This collection contains an online version of the catalog of objects from the ancient world (coins, textiles, pottery, sculpture, etc.) that are held by the University of Michigan's Kelsey Museum of Archaeology. It includes descriptions of over 98,000 objects and fine art photographs. The database is being expanded to include images of many of the artifacts. The Advanced Papyrological Information System (APIS) is a collections-based repository hosting information about and images of papyrological materials (e.g., papyri, ostraca, wood tablets, etc.) located in collections around the world. It contains physical descriptions and bibliographic information about the papyri and other written materials, as well as digital images and English translations of many of these texts. When possible, links are also provided to the original language texts (e.g., through the Duke Data Bank of Documentary Papyri). The user can move back and forth among text, translation, bibliography, description, and image. With the specially-developed APIS Search System many different types of complex searches can be carried out. APIS includes both published and unpublished material. The Bulletin of the American Society of Papyrologists (BASP) has been the official journal of the American Society of Papyrologists since its first publication and is devoted to papyrology and related disciplines. This database makes all issues of BASP available electronically, except the two most recent issues. This is a collection of over 20 digitized papyri from Egypt and Greece. This collection was assembled from texts provided by the Oxford Text Archive, the InteLex Past Masters Series, Internet Wiretap, and the Cambridge Text Archive. It contains classic texts from Virgil, Ovid, Bacon and De Lille. The Papyrology Room book collection consists of several thousand volumes of text editions, monographs and journals that deal with ancient and Graeco-Roman Egypt. The majority of the books in the Papyrology Rooms are shelved according to LC call number. However, editions of papyri, ostraca, etc., are listed according to a standard acronym as listed in John F. Oates, et al., (eds. ), "Checklist of Editions of Greek, Latin, Demotic, and Coptic Papyri, Ostraca, and Tablets" (Oakville, Conn., 2001). The Patrologia Latina Database is the full-text electronic version of the Patrologia Latina by Jacques-Paul Migne (1844-1855 and 1862-1865), including all prefatory material, original texts, critical apparatus, indexes and illustrations. It contains 221 volumes of early Christian (patristic) writings in their original Latin. The 25th International Congress of Papyrology took place at the University of Michigan in Ann Arbor from July 29 to August 4, 2007. This was the second time that the Congress convened in Ann Arbor (following the 12th Congress in 1968) and the third in North America (the 16th Congress in 1980 met in New York). Of the approximately 150 papers delivered during the Congress, 80 fully-referreed articles are included in this publication. The Department of the History of Art's digital collection consists of images digitized from slides, books, journals, and prints as well as digital images licensed from vendors, original digital photography donated by faculty, and images provided by other University Visual Resources Collections (VRC). In addition to digital images, the HART VRC Images collection includes data records of the Eleanor S. Collins VRC Teaching Collections, namely the 35mm slide collection. Humanities E-Book is a digital collection of 2,200 full-text titles offered by the ACLS in collaboration with nineteen learned societies, nearly 100 contributing publishers, and librarians at the University of Michigan's Scholarly Publishing Office. The result is an online, fully searchable collection of high-quality books in the Humanities, recommended and reviewed by scholars and featuring unlimited multi-user access and free, downloadable MARC records. HEB is available 24/7 on- and off-campus through standard web browsers. This collection contains over 4000 images from Humanities E-Book. This collection contains four accounts of travel in southeastern Europe, each of which contains a significant portion devoted to Bosnia and Hercegovina. They are: "Bosnie et Herzegovin: Souvenirs de Voyage pendant l'Insurrection", by Charles Yriarte, published in Paris by E. Plon et Cie, 1876; "Dalmatia: the Land Where East Meets West", by Maude M. Holbach, published in London and New York by John Lane, 1910; "The Balkan Peninsula", by Emile de Laveleye, published in New York and London by G.P. Putnam's Sons, 1887; and "Travels in the Slavonic Provinces of Turkey-in-Europe", by G. Muir Mackenzie and A.P. Irby, published in London by Daldy, Isbister & Co., 1877. Additionally, there are 100 titles that describe travel in southeastern Europe, and in particular, Bosnia and Hercegovina. SOSYAL BİLİMLER ARAŞTIRMALARI DERGİSİ, an international, peer-reviewed, from 2010 will be issued two times annually. SOSYAL BİLİMLER ARAŞTIRMALARI DERGİSİ, includes research on the fields of literature, linguistics, philology, history, geography, anthropology, archaeology, psychology, sociology, education, theology etc. Manuscripts (in English, in French or in Turkish) should not exceed 40 standard pages in length. Articles should be accompanied by a summary of size not exceeding 10 lines in English. The electronic submission of the manuscripts (in word format) is preferable. An excellent source of open access material on numismatics is at the E-Papers section of Moneta.